On top of my research for the town, I’ve also been reading other books from Summerside Press to get a feel for their expectations and what they are publishing, something I think is important for ALL writer’s to do in their genre/publisher of choice. I believe it’s called Market Research. 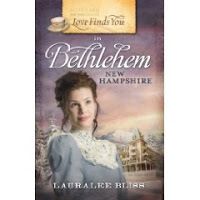 To that end, I’m privileged to bring you today my review of “Love Finds You in Bethlehem, New Hampshire” by Lauralee Bless. Sara McGee is not what Tom Haskins expected. The artist knew he was taking a risk when he reluctantly agreed to advertise for a mail-order bride but Tom assumed the woman who answered his ad would be more refined than the penniless and uneducated Sara McGee. Tom takes Sara under his wing, but he knows he can never marry her especially now that he’s suddenly receiving attention from accomplished pianist Annabelle Loving. While Tom’s sister is bent on transforming Sara into a lady, Sara knows she can never compete with Annabelle. Nonetheless, she finds herself drawn to the lovely mountain town of Bethlehem and to the artist who brought her here. But without a marriage to Tom, Sara knows she cannot stay. As preparations for Christmas transform the tiny town, will Tom come to understand the message of the first Bethlehem, that the most precious gifts don’t always come as they’re expected? This was a sweet romance that made me smile and sigh at the end–a must have for EVERY book I read. It did seem a bit slow in a few spots, but part of that is the hero is an artist and I have no, and I repeat, NO artistic ability within me. The best I do is a stick figure. So while he was talking about his art… I skimmed. But that’s just my weird, non-artistic self. LOL. LOVED the theme of the book, that it’s what’s INSIDE that counts, that we need to look beyond the pretty packaging and see people for who they really are. Something we all need to learn! Discussion: I’m in the mood for romance today. (no jesting from the peanut gallery, kay?) So! What’s your FAVORITE romance novel of all time? I’ll put no rules on this… although note that I am an inspiry romance snob so I will have no idea what you’re talking about if you list a secular romance unless it’s a classic… *grin*. Oh, and Romeo and Juliet does NOT count. TOTALLY not a romance. Love story that irritates me is more like it! Seriously? They kill each other in the end? UGH! Pride and Prejudice, without a doubt. Read it at least a dozen times, seen all the movie interpretations. I started on of the Love Finds You books and couldn't keep going. I'm not sure why. Maybe it moved too slowly. Or as we talked about in your post yesterday, maybe there was too much back story. I'm not sure. But I'm sure yours will definitely be great! Jody, I have many of the books. Three I've started and couldn't keep reading because they were way too slow (and yes, as you said, the back-story issue) but many others I loved. Just goes to show that there is the whole subjectivity to the matter. That said, I'm still looking at my own WIP with a critical eye, because I'd not call it sweet really… It may be that I end up tweaking it a bit to try and market to other publishers if Summerside doesn't like it. We shall see! Hmm… I'm going to go with a movie here. I love "Runaway Bride". Hands down, it and "P.S. I Love You" are my favorites ever! Pride and Prejudice is #1, but, since someone already listed it, I'll say that I also love Wuthering Heights (though you may not count it) and Rebecca by Daphne Du Maurier. Way Awesome. i haven't read a single love finds you book yet. wonder why that is? sounds like a good read…maybe i've just never seen any in the bookstore or library. as for my favorite romance…i'm a big P&P fan, but here recently, the vamps have taken over! i love twilight's story. it's so haunting and powerful. to say it's my favorite is tough…but i certainly find myself pondering it. another favorite is the Phantom of the Opera. Christine's plight bewteen the dark phantom and hero Raoul just gets me every time. Calico Canyon…I loved the romance in Mary Connealy's Calico Canyon. Ohhh, just realized I didn't share MY all time favorite romance! But I also liked the more sweet romances like Lori Wick's Sophie's Heart, historicals like Deeanne Gist's Bride in the Bargain. Not to mention funny lady Tamara Leigh's Faking Grace and Splitting Harriet. Ugh, yeah, I just can't settle one one. Horrible writer confession: I'm NOT all about the classics. I tried to force myself to read Wuthering heights and failed. And, don't slap me, but I've never read Pride and Prejudice, nor seen the movie. Guess I should rectify that, huh. I love your excitement for your book. I hope it sells. Okay, favorite romance of all time…Go ahead and start laughing. I'm a paranormal/fantasy fan, so I'm going with Twilight. BUT! I liked Twilight. Go figure! I watched it like 5 times when I rented it… mostly consecutively too. Suffice to say, it's the one "paranormal" movie I actually watch! I'm actually not a romance reader, but I couldn't resist posting the joke above. Let's see… I'll just say how happy I was that the Harry Potter series ended with two couples getting together who absolutely HAD TO BE together forever. It would have been so unsatisfying if Rowling hadn't given us that epilogue so that we knew for sure things would turn out right in that area.